The Cybex Institute for Exercise Science recently launched the Cybex Golf Performance Program which was designed from the ground up to enhance the specific physical attributes that can lead to a smooth, efficient, and powerful golf swing for any golfer from the amateur to the professional. The program even simulates various scenarios of a golf course to strengthen the main attributes of a golf swing in diverse conditions. So, how did we accomplish this? We conducted exhaustive research on over 500 golfers of various abilities. We examined each person’s strength, flexibility, alignment, balance, and finally their swing characteristics. From this data, we determined four physical prerequisites that are essential to any successful golf swing, no matter what type of movement that is put on the ball. These prerequisites are rotation, dynamic posture, balance, and weight transfer. As you train these areas that enhance your game, you also reduce the risk of an overuse injury on the golf course. This is because the workouts condition the foundation of your swing and the active muscle groups that power it. We respected that not every golfer’s game is identical which is why efficiency was our top priority for any player. But how does the program help my swing on the banks and slopes of a golf course? We took into account the unpredictable terrain of the sport and worked it into the program. Cybex created platform wedges that are utilized in many of the workouts to simulate where the ball lies in relation to your stance. 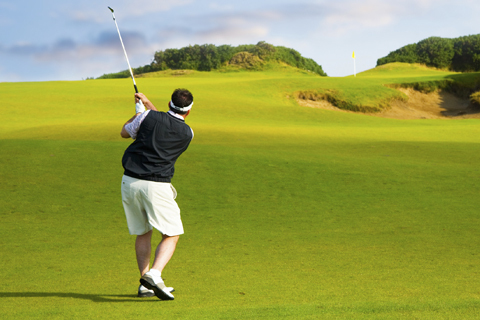 Let’s say that you feel your body is not responding well when the ball lies above your feet on a hill. The Ball Above Feet Rotation exercise allows you to get into the correct posture and exercise the precise muscle groups that assist this aspect of your game. The same goes for downhill positions. Building a strong foundation to enhance your swing in most golf scenarios is what this program is all about. Cybex realizes that as a golfer, your main priority would be getting on the course and putting your results to work. 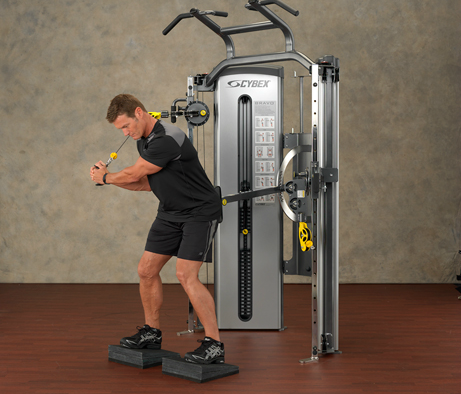 That is why Cybex designed this concise program so that it can be completed in sessions of 20 minutes or less. This way you can get back out there dominate the course. For more information on the #1 Way Pros Get Fit, visit the Cybex Golf Performance Program page. Learn how lower body strength training can help you off the tee in this two-part golf blog.